The birth of Japanese Green Tea is done through a process of steam blasting out the oxidizing enzymes to restrain fermentation. This process allows the tea leaves to remain green in colour, it also prevents the loss of vitamin C contained in the tea. The various categories of Japanese Green Tea can be divided into: Sencha, Bancha, Genmaicha, Hojicha, Kukicha, Gyokuro, and Matcha. Unlike the processing steps of other green teas, Matcha is dried in its unrolled shape after the steaming process. The tea leaves then goes through the step of twigs, stems, and vine removal. The refined tea leaves then becomes Matcha and is ground by tea mills in climate controlled rooms. The drinking of Matcha also differs from other types of teas. The proper way to make Matcha is to put 1 ½ tea scoops (approx. 2g) of Matcha in to a tea bowl and then pouring hot water (First bring water to boil and let it cool down to 80 degree Celsius). Then, using a Matcha whisk, stir the tea until the lumps are removed and fine foam appear on the surface which means the Matcha is smooth enough to drink. The intake of tea leaves permits a vast amount of vitamin and iron contents of the tea to be absorbed in the body. Each type of Japanese tea contains its own characteristics, such as: drinking Bancha in the morning will get rid of the feeling of sleepiness, thus feeling refreshed; drinking a cup of Hojicha to put you in a relaxing state of mind. Tea comprises of Flavanols, a form of Polyphenol, with antioxidants to aid in the lowering of cholesterol as well blood pressure. The more talked about Catechins, a kind of Polyphenol is effective against influenza, and cancer. In addition, the Catechins found most abundant in green tea works to strengthen the immune system, and inhibit cancerous cells and ulcers. Even though such nutrients can be absorbed via fruits and vegetables, when compared with spinach, garlic, or carrots, green tea surpasses in nutritional value. Not only that, tea can also prevent cavity, heart related problems, and strengthen bone density. In order to make an exceptional pot of green tea, one has to take into consideration both the duration of the steeping process, and also the temperature of the water. The sweetness of green tea can be brought out by immersing it in low temperatures. 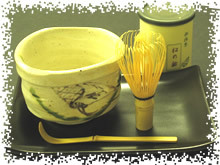 In contrast, the bitterness of the green tea will be brought out by higher temperature water. As humidity, air, light and heat may cause spoilage in Japanese tea, it is necessary to keep the tea in an airtight container and place it in a cool place in order to preserve its freshness.